In a slow economy, it’s second nature for business owners to focus solely on their operations and put marketing on the back burner. But to the public, they are communicating exactly what they are doing: focusing on their current clientele (billable time or cash flow) and ignoring their new customers (operations). There’s no overarching marketing message here, folks. They are only concentrating their efforts on the inside and not really viewing their company from a their customers’ point-of-view. I’m a fan of John McCann’s Irish Oatmeal (almost daily, around breakfast time, in fact), especially its packaging. Besides the unique tin can, what draws me in is the controlled use of two colors, black and gold. The type is not even that great but it shows its 150-year history and how it packaging used to be. Before and after packaging designs that are worth taking a second look. 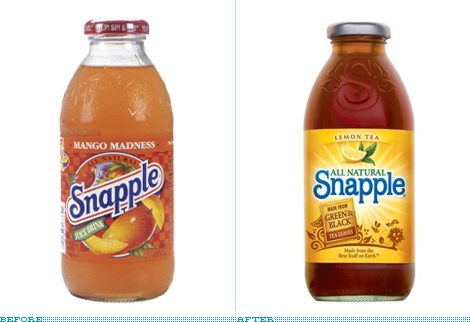 Snapple is getting their biggest makeover in 37 years, which include new formula, reduced calories, updated logo and packaging. Design by the firm CBX. Nice job. There’s a couple of new restaurants in our neighborhood, and this being downtown Los Angeles, there always seems to be something popping up regularly. What I mean by that is that downtown LA is going through a revival right now, and although there is a great need for street-level retail, there is also a lot of competition to be the best–which keeps it interesting for us who work and live here. The two new eateries I’m speaking of particularly are Blu LA Café and Cole’s Pacific Electric Buffet. Blu LA Café is a new little restaurant on the bottom level of the Pacific Electric building that features upscale food with a Southern flair, wine and pastries. The decor is mostly blue and modern with wood and brick accents (it’s more IKEA and less DWR). Its where you’d go for a glass of wine for a LAMILL coffee and a quiet moment with your laptop or a book. In the response to the ad focus from television advertising to online media and search ads, there’s been a recent surge in outdoor ads taking a creative spin. Great outdoor advertising will be sensitive to the conditions and situation of its placement, not only the location. Such delightful ideas demonstrated in our everyday environment sometimes encourages us to get off of the computer and walk around for a bit of entertaining installation art. Here are a few great campaigns. A few casualties in the parking lot. I assumed this one got some good press.